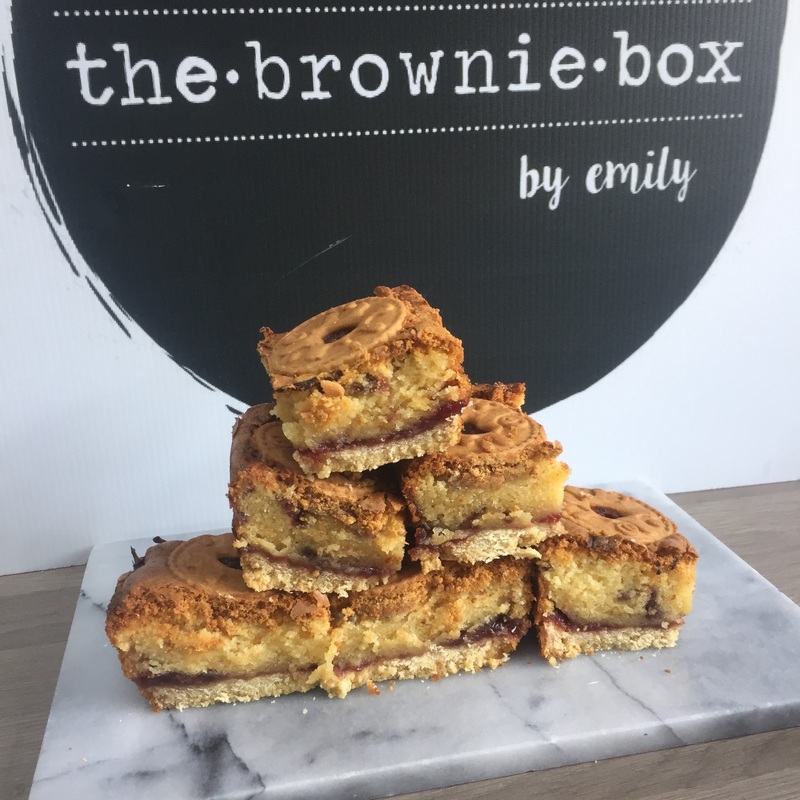 Jammy Dodger Blondies – fully loaded jammy dodger Blondies, with a buttery biscuit base, raspberry jam and raspberry coulis laced Blondie, topped with a raspberry Jammy Dodger. How long will my brownies keep for? Your brownies will keep for 14 days at room temperature, and will keep for 3 months in the freezer in an airtight container. Each box comes with 6 brownies, which can serve 2 people if you are feeling peckish, or are an awesomely huge, gooey treat as a whole brownie for one person! What allergens are there in the brownies? All of our brownies contain milk, eggs, gluten, soya and traces of nut may be found as our kitchen is not a but free area. Can you cater to special dietary requirements i.e. gluten free or dairy free? The short answer is yes, we can cater as part of a bespoke order. Please fill out the contact form with your specific requirements and we will get back to you as soon as possible. Of course, just add it into the comments section at checkout and we will send it out with your order. All brownies are delivered by Royal Mail First Class post if shipping is selected at checkout. If collection is selected, please await an email confirming that your order is ready to be picked up from brownie box HQ. We can also deliver to certain parts of the EU. Please send an email to [email protected] to enquire and for prices. Please allow 4 working days for your order to be processed as we bake each batch fresh. We will inform you when your item has been posted, and give you an estimated delivery date (usually the next working day). Please note we do our best to deliver as close as possible to your requested date but accept no liability for late deliveries unless your brownies have not been delivered within 4 working days of your order. If you urgently need the brownies at a particular day/time, please contact us as we will organise for an upgraded delivery at an additional cost. Our standard shipping includes postcodes in England, Wales & Scotland.